The Justice League movie was disappointing to a lot of people, either because it simply wasn’t that great or because Joss Whedon and Warner Bros. were involved in a ridiculous conspiracy to undermine the work of true visionary like Zack Snyder, but it turns out that Justice League may have been especially disappointing to Warner Bros. executives. As reported by ScreenCrush, the movie has just ended its worldwide theatrical run as the lowest-grossing film of the entire DC Extended Universe series—which began with Man Of Steel in 2013. 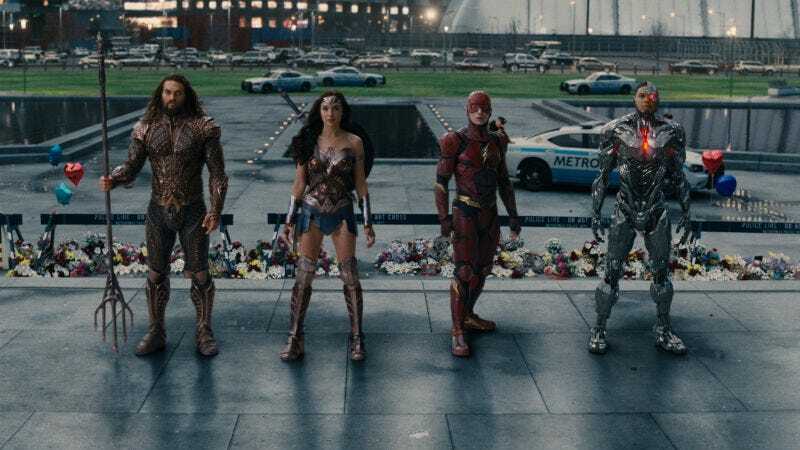 By the time the dust had settled on the last showing of the film’s final battle, Justice League had made $647,924,295, which is a ridiculously huge number, but it still doesn’t live up to any of the other recent DC movies. Worldwide, Man Of Steel made just over $668 million, Suicide Squad made $746 million, Wonder Woman made $821 million, and Batman V Superman: Dawn Of Justice made nearly $874 million. That seems to imply that the experience of Batman V Superman kind of soured everyone on the DCEU’s interpretation of the core Justice League members (other than Wonder Woman), but it also probably says a lot about just how crazy people were for Wonder Woman and Suicide Squad. Given the relative stand-alone nature of those movies, it makes sense that Warner Bros. is reportedly rethinking how it handles this whole DC cinematic universe idea.